John Waddle and radiologist Steven A. Sirr MD have developed a unique expertise in using computed tomography — CT Scans — to visualize valuable bowed string instruments. The project began when Dr. Sirr brought his violin to work with him and, out of curiosity, ran it through a CT scanner. CT can provide the modern luthier and acoustic scientist with a unique tool for noninvasive evaluation of an instrument's structure, defects, and repair history and for accurate measurements of its wood thickness and density. 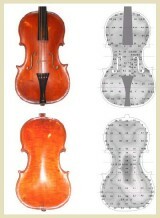 CT derived information may aid luthiers in replicating the qualities of original masterpieces. CT evaluation may have an important role in the valuation, insurance, and identification of valuable stringed instruments. "The Progress of Progress" is an article I wrote with Steve Sirr and Steve Rossow about the Betts Stradivari violin of 1704. If you click on the title, you should be able to download the pdf of the article. This is an article, written by Steven Sirr, Steve Rossow, and I about the wood used by the Cremonese master violin makers. An article I wrote for the ASTA journal here in Minnesota.